Welcome to the WNPA convention registration page! Please follow the registration instructions below. 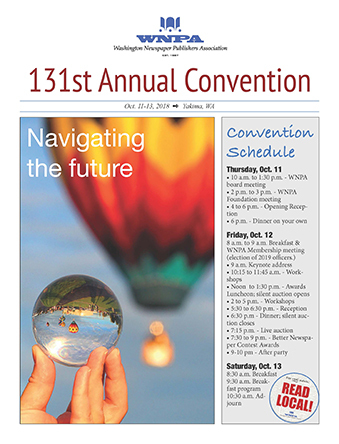 • Convention registration deadline is Sept. 14. • Click "Register Now" button at right to begin. • Skip past the "Login to register" button. You do not need to login to this website to register for the conference. • Select Full Registration if you plan to attend the entire conference. • Select A la Carte Registration if you plan to attend a portion of the conference. • Call WNPA at 360-344-2938 for registration help. • You need to make your own hotel reservations for the conference. • To get our reduced rate, all hotel reservations need to be made by Sept. 14. • Call (509) 248-5900, our registration code is NEWS1010. Click on the brochure cover to download the schedule!